It’s very much ‘vibe over theme’ for couples when it comes to wedding planning in 2018, with the ‘feel of the day’ dictating decor, food, venue and fashion choices, rather than rigid colour palettes and ideas that might have set the tone before. 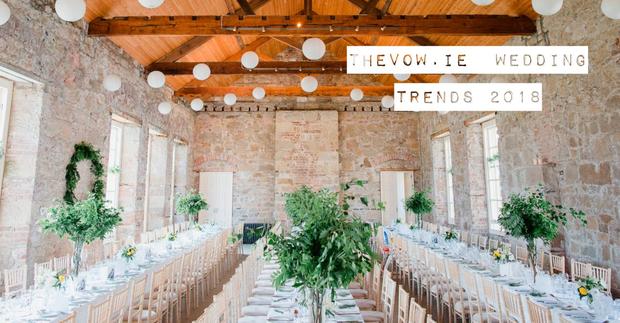 From vegan wedding cakes to hanging floral installations, and ring-bearing pets to handfasting ceremonies in spectacular settings, there’s something for every type of couple in THEVOW.ie's run down of the best Irish wedding trends for 2018. Overall, decor is minimal and elegant, with greenery continuing to dominate floral design, and copper and chrome taking the place of rose gold when it comes to up-to-the-minute metallics. There’s an emphasis on creating fun and colourful photos for the all-important album, while lawn games, flexible wedding parties, outdoor speeches and family-style dining will all add to a relaxed feel to the otherwise formal day. Come May, of course, we’ll be looking to a certain royal wedding which, like so many before it, is certain to set trends for wedding celebrations months and even years from now. 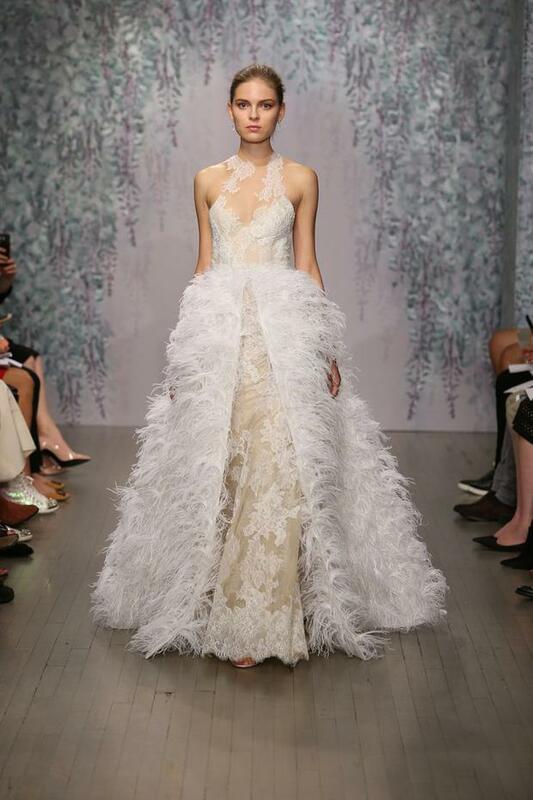 For now, here’s what we tip to be the biggest trends in weddings for the coming year. While many couples favour the symmetry of a three-aside wedding party, the traditional cast of identically clad characters has had quite the shake-up in recent years. 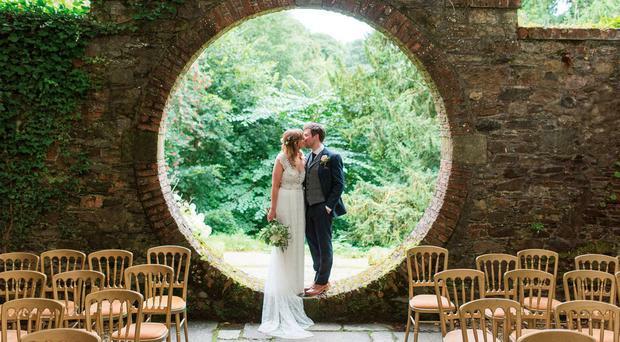 For 2018 expect the best woman, bridesmen and groomswomen to make an appearance, as more and more couples realise they don’t need to fill traditional roles the same way they did in the past. For couples who share a big group of close mutual friends, they idea of splitting them into categories based on gender might not seem quite right, which follows that hen and stag parties might also become more of a mixed celebration going forward. Other roles are open to interpretation, too. A current trend of both parents, mother, grandmother or sister ‘giving the bride away’ is making its way to Ireland. Another fun trend is giving the flower girl role to a family member or friend — we suspect we’ll be seeing a few more ‘flower grans’ making their way up the aisle in 2018. Pets too are becoming a big part of wedding parties this year (indeed an appearance by all sorts of animals from alpacas to chickens is a big trend in wedding photography) as couples give the role of ring bearer or ‘best boy’ to their furry friend. First came the bride’s speech, then the maid of honour’s, and for 2018 in an effort to make weddings even more laid back and relaxed, couples are throwing it out to the floor when it comes to speeches — and doing it all outdoors. 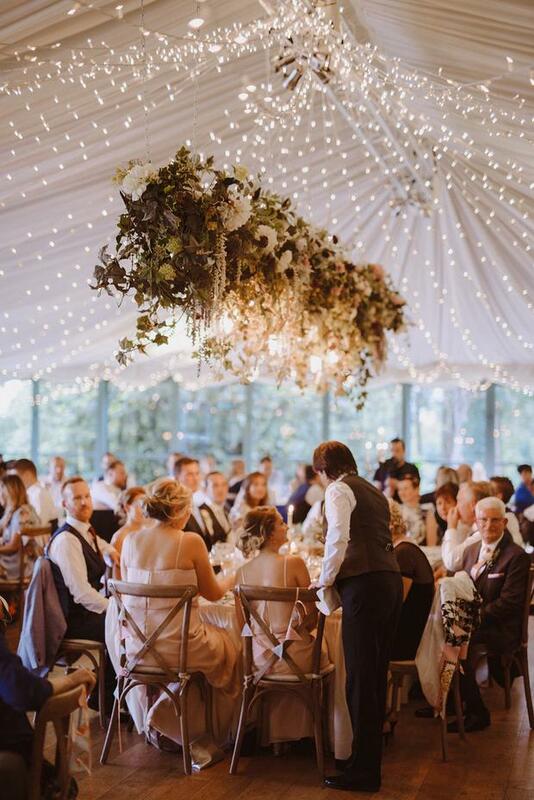 For summer weddings, a chilled drinks reception on the lawn can make for the perfect spot to hold the wedding speeches before dinner time, and is a great way to shake up the schedule and keep guests on their toes. 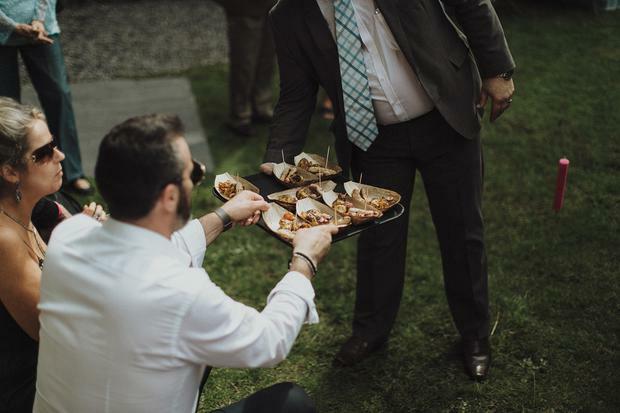 It makes sense for smaller, intimate weddings and means the wedding coordinator shouldn’t have to get into a squabble with either the kitchen or the band due to timing. By getting the speeches ‘out of the way’ in a more informal manner (ie without a microphone or top table in the way), those speaking are free to enjoy the reception and meal without any butterflies. Another idea some couples are playing around with, too, is the ‘open speeches’ where guests can take the chance to say a few words should they suddenly find themselves inspired to do so. This works especially well for those who might not have set a solid wedding party, or for those who have friends who are just particularly proficient at public speaking! When it comes to wedding decor in recent years, it’s been all about the signage. And for 2018 the trend continues with couples finding more ways to direct, inform and inspire their guests with elegant wooden notice boards and theatrically lit lettering. For practical purposes, good signage can be a saviour on the day. For country house weddings, directions will always be a welcome addition for guests who find themselves winding their way around stables and gatehouses en route to the barn (or similar) for the ceremony, while couples who have gone to the effort of creating a special hashtag to make sure they see all the snaps from their big day across social media can directly inform guests of their marital tag with ease. With modern weddings going for a more minimal feel for 2018, an emerging micro trend of acrylic and glass signage — featuring chic and sophisticated calligraphy — is one to look out for. Another micro trend due to make an appearance at some more edgy weddings this year is the neon sign that’s currently having ‘a moment’ in interior design. These custom lights work particularly well as photo booth backdrops, and on dancefloors, but have also popped up in kitsch ceremonies (think Vegas-style Little White Chapel sans Elvis) and are sure to make quite the splash in some seriously cool weddings in 2018. There are a whole host of gorgeous bridal trends making their way to stylish aisles this year, but for us, the detachable skirt is the one with the real ‘wow factor’. While stylecasters are tipping ‘arm warmers’ and detachable sleeves as the bridal trend to watch Stateside, Irish brides are still favouring a full lace or sheer sleeve when it comes to covering up, and keeping their convertible look below the waist. These detachable wrap skirts and full trains add some serious drama to dresses, and can allow for a big statement look for the ceremony that’s easily altered for the dancefloor. They also give brides a chance to don another big trend for weddings in 2018 — the high-low hemline — without having to stick to one rigid look. Princess capes, bridal jackets, pantsuits and jumpsuits are all set to make more appearances this year, which will also be the year we see bridesmaids upping the sparkle-stakes with beautiful vintage-style beaded- and full-sequin gowns. While many couples are busy trying to come up with a personalised wedding hashtag, others are settling on a completely opposite idea altogether — the unplugged wedding. Both ideas have their merits, and both trends can actually complement each other on the day if you do them right. Unplugged ceremonies are set to be a big trend this year with couples wishing to have their guests well and truly ‘present’ at their vows — and not blocking the aisle to get a good snap of the bride or forcing the people behind them to watch the couple declare their love for each other through the screen of a smartphone. A few signs strategically placed at the entrance, and a word from the celebrant before proceedings begin, should help to get the word to everyone to turn off their phones, while similar signage detailing your hashtag on the dinner table will give everyone the green flag to snap away again, making sure to tag you with anything they pop up on Instagram or Facebook. 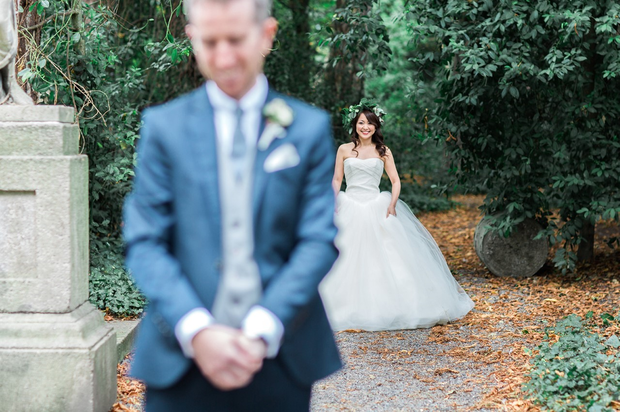 While church ceremonies remain the most popular option for Irish couples, the rise of the Humanist wedding has brought about the emergence of some new and old rituals. One non-religious ‘ritual’ we expect to see popping up in weddings this year is the wine or love letter ceremony, where couples write a letter to each other and seal it in a wooden box with a bottle of wine and two glasses to be opened on a milestone anniversary down the line. The biggest trend on the rise, however, is the handfasting ceremony, which is believed to have its roots in Celtic tradition. For this, the wedding party or special guests are invited to bring a piece of cloth or ribbon to tie the knot around the couple’s clasped hands as they say their vows. County colours, old wedding dress material, jewellery and other unusual and personal items can all be used for this, and the final product makes for a great keepsake for the couple after the day.